Though there may be miles of separation between this little English village and the bustling city of Dubai, they may be closer in spirit than originally thought. The village of Godolphin Cross in Cornwall has been raising money to buy their local methodist church so they can convert the building into a full-fledged community center. The villagers has been desperate to save the facility, as its already the closest thing to a community center that they have. However, the whopping real estate sum of $115,000 was too much for the little community to afford on their own. Despite managing to raise a third of the finances through multiple fundraising efforts, Godolphin Cross still came up short. 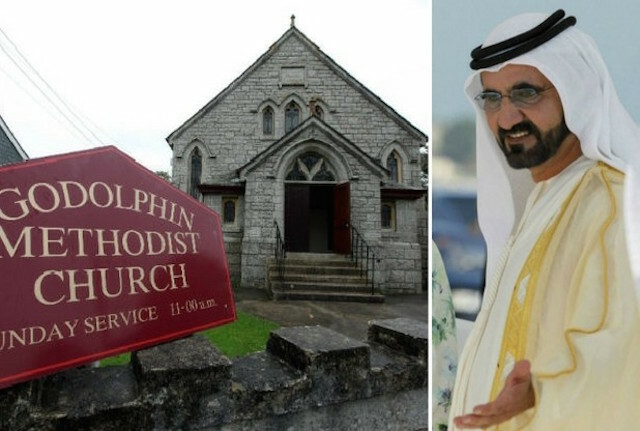 Then, back in November, the villagers made one last appeal to one of their very distant acquaintances: the Prime Minister of the United Arab Emirates, His Highness Sheikh Mohammed bin Rashid Al Maktoum of Dubai. The connection between the Emir and Godolphin Cross goes back to the 18th century. As well as being the Prime Minister, the sheikh also happens to be the head of a horse racing empire. The Godolphin Arabian was a racing horse that was bred in the tiny English village of Godolphin Cross in 1724. All of the sheikh’s racing horses are considered direct products and descendants of that first breed, according to Cornwall Live. So when they reached out to Sheikh Mohammed in November, they were overwhelmed when he agreed to cover their financial shortfall. “We can’t thank Sheikh Mohammed enough and we’d love to see him in this neck of the woods any time. He would be assured of a very warm welcome,” association chairman Richard McKie told Cornwall Live.